Is this a possibility or a pipedream? I love both my outlook Calendar and my Evernote and wish they could get together. It seems a happy marriage could come from the meeting. Is it possible and if so how? Absolute +1. One of the most important feature request IMHO. When M$ can integrate EN Reminders in their Android Outlook App, a deeper integration would only be logical. But AFAIK, The only Integration today possible is the mentioned mobile app, and the Email-Clipper-Addin in Outlook Desktop + Web. IMHO this is one huge chance for EN to really be successfull with professional users and businesses. M$ is now desperate to find partners, in comparision to their quite brutal business practices in the past. On the other side, on MS uservoice ppl screaming for deeper EN integration, so the pressure is there. We will see if and which side will fvck this up. I wouldnt want to bet money on this (But pay 1-2€ / Month for a deep integration as additional service). But this is a logical step, and eventually they cant avoid it. If EN doesnt take the chance, OneNote will gain more attraction. All those with a Office 365 Plan, schools+universitys+students, businesses, could be potential happy customers with EN. As a single walled garded App without integration to other services, no company can compete in 2016. This trend will only grow in the future IMHO..
PS: PLEASE USE THE UPVOTE FEATURE ON OP TITLE WHEN YOU SUPPORT THIS FEATURE REQUEST! 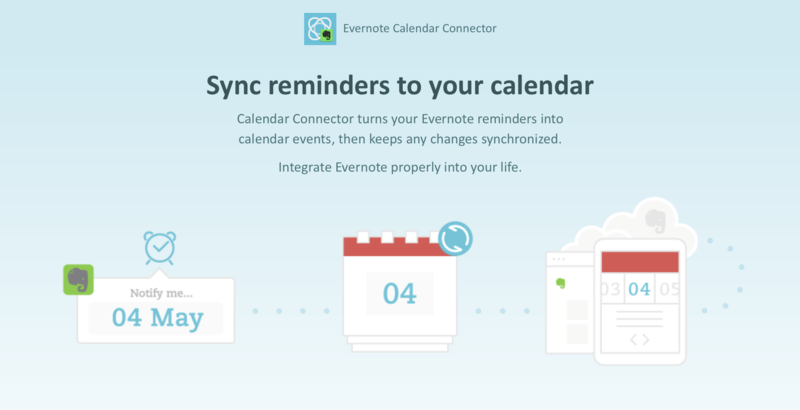 The best solution available for you at the moment would likely be to use the Calendar Connector for Evernote (by the talented software developers at Cronofy). Calendar Connector will turn any reminder in your Evernote account into an event in your calendar (appearing on the date you set the reminder to occur). It will then automatically keep any changes synchronised (irrespective of whether you make the change in your calendar or in your Evernote account - true two-way synching). Note that you will now get a reminder from Evernote and a reminder from your calendar app, which mitigates against forgetfulness but on occasion may be a tad annoying if your workflow includes a lot of reminders (#FirstWorldProblem). And...it's free. Pretty impressive. Extremely reliable. Hard to fault. I hope this post doesn't inadvertently breach the moderator guidelines by being positive and not whinging about anything .